Tucked into a quiet lane in the heart of Ubud, Taksu translates in Balinese as “the indescribable essence of spirit,” and provides a serene haven in which to relax and unwind. A charming garden filled with cascading rock ponds and meandering paths gives way to a leafy gorge dotted with scenic spa pavilions. Well established on the Ubud scene, the spa and restaurant have been operating for the last seven years, while the quaint Taman Taksu Garden Cafe makes an inspired new addition. Open-sided wooden pavilions overlook the medicinal herb garden, where leaves are plucked fresh for my Pagagan Juice a traditional remedy known as pennywort in English, believed to be beneficial in maintaining youth. Our round of drinks also includes [Coconut Water] served in customised coconut-shaped ceramic dishes, and a Bali Summer blending watermelon, strawberry and apple with a lemon citrus kick. The menu, prepared by Balinese chefs Ketut and Adi, offers something for every mood and every appetite, with a good selection of raw food, gluten free, vegan and vegetarian fare, as well as chicken, duck and seafood. Produce comes straight from Taksu’s own organic gardens, located in the nearby hills, and dishes include crunchy organic salads, homemade pasta and panini, Indonesian classics, hearty soups and grills, and divine desserts. We start with a couple of raw dishes. The Strawberry Bisque is a chilled and frothy blend of fresh strawberries and yoghurt, while the generous slab of Zucchini Lasagne that follows is truly excellent, a tasty testament to the imaginative possibilities of raw food. 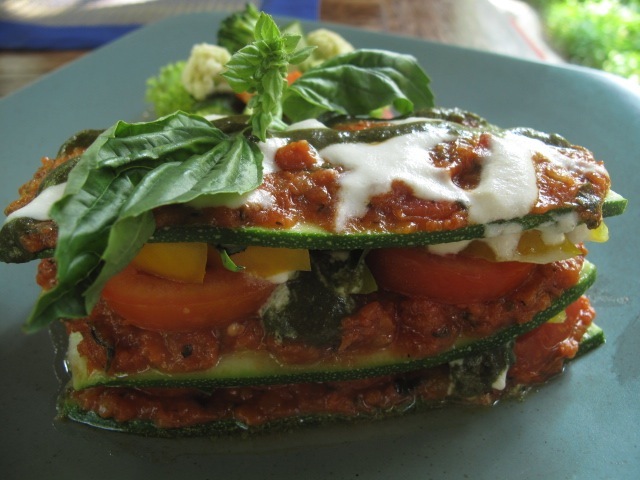 Thinly sliced marinated zucchini is layered with fresh tomato, basil and peppers, with a tangy marinara sauce, creamy cashew ricotta and an ever-so -slightly sweet pesto. Changing the pace a little we order some good and spicy Nachos piled high with black beans, homemade salsa and creamy guacamole, and a Salmon Panini made with home baked brown bread topped with swirls of cured salmon, red onion, lettuce, dill and dollops of cream cheese. Dessert is a light and fluffy Cheesecake sweetened with a thick strawberry coulis, and a spongy Truffle Chocolate Cake Gateau with a rich chocolate filling. As well as daily yoga and dance classes, Taksu offers interesting workshops and retreats of the alternative healing persuasion, as well as Cranio Sacral therapy, Traditional Chinese medicine, ozone therapies and spa treatments including the Divine Pampering Ritual which is accompanied by a two-course healthy lunch.